Self-portrait with Bliss. Just a forester and his dog. 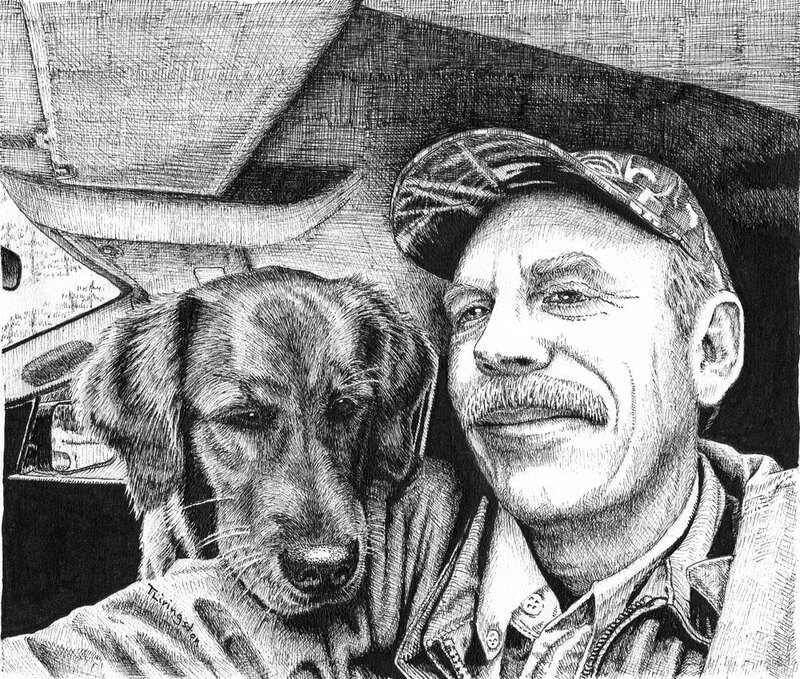 This entry was posted in Drawing, Pen and Ink, Traveling Companions and tagged bliss, drawing, Forester, Forester Artist, golden retriever, pen and ink, self portrait by foresterartist. Bookmark the permalink. Bliss thinks she’s pretty perfect! You are always so great in sketching the animals, what was it like sketching yourself? Norman Rockwell seemed to like painting himself. No, I was not stroking your ego, you include detail that so many other artists omit, you and Norman include the heart of the subject into your work. Incredible pen and ink. I really like this one. 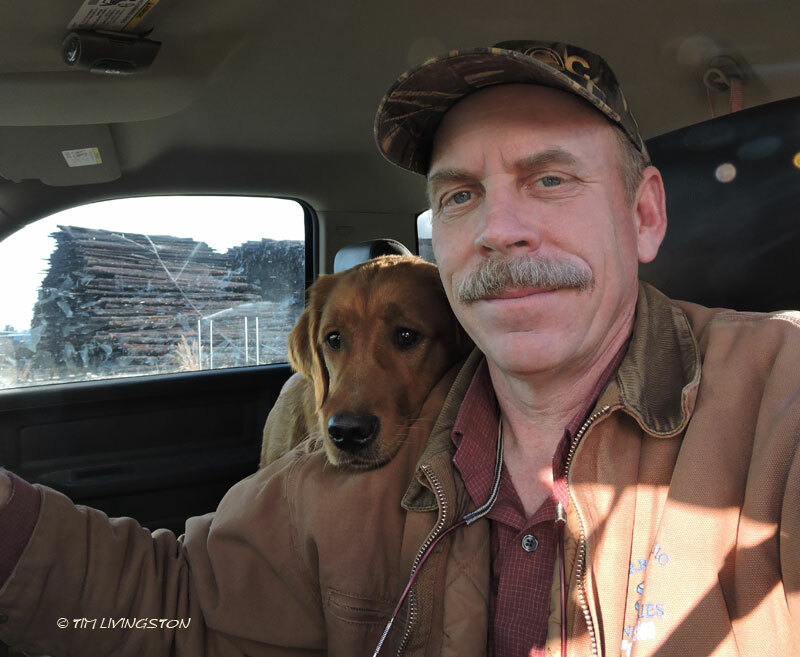 So much love that man and dog have for each other. Aah, now don’t be modest. You are looking good., Tim. Terrific artwork and a priceless memory of everyday life with you and your dog! Thank you Linda! Bliss is pretty priceless to have around. Love it! You did a great job. I think self portraits would be the hardest to do. Thank you Judy! I don’t know if self portraits are harder than other portraits. I just think portraits are hard, especially pen and ink portraits. I admire people who are really good at it. This is outstandingly good and so beautiful❣️Love this sketch. Excellent pen n ink work. Thank you so much Hansi! Good one Tim, lovely pose with Bliss. Gosh Tim you are a really good artist!!! Thank you so much Chatou! Great pictures and a cute looking friend you have there. I used a picture of my Labrador to front up my blog all about what he gets up to. Not my handiwork though, someone else’s drawing. Thanks for sharing these. Your boy’s adorable. They sure know how to work us, don’t they. Wow, thank you Michael! I’m not sure what to say, except I look better in you’re portrait. Your rendering is absolutely ‘furbulous!’ Thank you for swinging by the Ranch. We 💙 visitors, especially those who are incredibly talented. What fun! A pen selfie! You and Bliss are quite an adventurous pair. That Bliss, she never wants to be left behind. She knows how to work me good.